In the table below I give the averages of my student survey ratings. The first column indicates the institution, the second column is the statement that the students evaluated; the first four institutions use a 5 point scale, with 5 being highest. Columbus State uses Yes/No questions for their instructor evaluations. Rutgers University ratings are from Ornithology in the summer of 2010 and spring of 2011, and Wildlife Ecology & Conservation in fall of 2010. The data from Stockton College are derived from the four semesters of the 2009-2010 and 2010-2011 academic years. Rowan University ratings are from Introduction to Natural Resources during fall of 2010. Columbus State Community College ratings are from Biological Sciences II (fall 2011) and Introductory Biology (winter 2012). Ohio Dominican ratings come from thirteen semesters (2012-2018; plus some summer courses) as an assistant and associate professor (see above for courses taught). "Overall, I rate this instructor as an excellent teacher" or "Overall, I would describe this instructor as excellent"
"Overall, I rate this instructor as an excellent teacher"
"I rate the teaching effectiveness of the instructor as:"
"Considering everything, evaluate this teacher's ability to teach the course"
"I would recommend this instructor to other students"
Below are selected student comments which were anonymously written on evaluation forms at Ohio Dominican University, Stockton College, Rutgers University, Rowan University, and Columbus State Community College. No changes have been made except minor spelling or capitalization corrections; words in [brackets] were added to make the comment more clear. An ellipsis indicates that the portion presented was part of a longer comment. "I have had Dr. Mathys for a few courses over my short college career thus far and I can say without doubt there is not a better professor to learn from on this college campus, or any other campus, in my opinion. Dr. Mathys shows a true love for all of the material that he teaches, as well as entertains the class and keeps it light so that the learning environment is not only comfortable but very easy to succeed in if the student takes it seriously. When I decided to come to ODU knowing it was a smaller campus, interactions with professors such as Dr. Mathys were what I was hoping for. He is truly a professor who will take any amount of time out of his day to help you succeed, not just in his class, but in life in general. I would highly recommend this class to anyone that I ever talk to, as I would any class with Dr. Mathys as the instructor." "Great professor. Makes the class fun and interesting. He is open to helping anyone as much as they need it." "I'm not a science major and he really made me enjoy the class. Would definitely take another course if he taught [it]. Also, a great person who really tries to help his students learn the course material." "Great course! Dr. Mathys made this class extremely interesting. Hands on activities like catching birds outside was a great way to keep students engaged. I would strongly recommend this class to others." "Very good teacher who really helps his students. Probably the best teacher I have ever had." "This was an excellent class. It was very interesting and covered relevant topics in society. Dr. Mathys is a great instructor. He is always available to help students." "Dr. Mathys is probably the most helpful professor I have ever had. He is clearly invested in our success!...Overall, this is an excellent class and I both learned a lot and enjoyed being here"
"Overall a great class. At first, I didn't know what to expect, but I am so glad to have had such awesome experiences." "Dr. Mathys remains one of the best professors at this university. He strives to provide an atmosphere where questions are encouraged, and seeks to help students at all times. I would recommend any of his classes." "Although this course was difficult for me I can honestly say this was one of my favorite biology classes I have taken at ODU. Dr. Mathys is a great professor and you can tell he enjoys what he does. I would without a doubt recommend this class to someone because it not only has challenged me, but it has opened my eyes to new ideas. Thank you Dr. Mathys for helping throughout this semester I appreciate it all." "Dr. Mathys is my favorite professor! He really cares about his students and made this class so much fun! If I wasn't a senior I would change my major to environmental science." "Awesome instructor! Dr. Mathys made this course a lot of fun and I enjoyed coming to class. He is eager to answer questions and help students understand the material. Even though this was a shorter course, I feel like I was able to really learn from the material. Dr. Mathys' note set-up helps keep students engaged and his sarcasm keeps the class entertained. He also plays a variety of videos in class to help students visualize the information which is very helpful. I'd recommend this course to anyone." "Dr. Mathys' enthusiasm made the course so much more fun and really helped reignite my love of biology." "Dr. Mathys made this class really fun and easy to learn. He was always there if we had questions and willing to help. I would take another course from him. I learned a lot." "Outstanding course. The professor was clear and on point all the time." "Very good instructor, funny, nice, knowledgeable about area. Breaks down information so could understand. I would recommend this class and instructor." "For once in my life the labs actually felt like they related to the course material." "By far the greatest class I've taken here. Mathys is a great professor." "Excellent teacher! He made learning the material fun and very interesting!" "Dr. Mathys is an excellent instructor. If this course was taught by any other professor it might not have been as interesting. I would love him teaching other Biology courses." "Dr. Mathys is a fantastic professor with an excellent grasp of the subject matter. I highly recommend the course." "One of the better teachers I've ever had. Thank You"
"Overall this class was good. Dr. Mathys is an awesome professor. I really like his teaching style. The labs are a lot of fun...He seems to really care about his students...Thanks so much for a great semester Dr. Mathys. I wouldn't have held a bird if I didn't take this class! It was really cool." "I liked how you made yourself available at all times and how you were always willing to help. I liked how you went over all tests and quizzes so we knew what you were asking for. I liked all the labs." "I really enjoyed this course. If you will teach other courses, I hope to sign up for it. By taking this course I now show strong interest in the field of study." "The course was great, just enough work and Dr. Mathys did a GREAT job!" "Dr. Mathys greatly improved the class. His clever jokes and insightful thought provoking topics made the class that much better." "I loved this course and the professor. All the hands on work made the course material easier to understand and more fun to learn. I explored a new field of interest in this course and with the professor's help I learned to appreciate the topic much more than I already did." "The instructor was one of the best instructors I had when lecturing, with unique explanations that I think aided in my understanding." "Dr. Mathys made this class very enjoyable. He is very approachable and helpful." "This was a really excellent and exciting class! I hope to have Dr. Mathys again!" "Blake Mathys is one of the best teachers [I] have had at Stockton. He always explains the material clearly and does his best to help his students succeed. His classes are challenging but you always come out feeling accomplished that you have learned so much." "This instructor often made the subject matter interesting and fun. I would recommend him to other students." "Good teacher. Tough but fair." "Very good teacher. Explains things very clearly. Offers help regularly. Always there for questions." "Blake is an amazing instructor. He gets his students involved by continuously interacting with them and making sure they participate. His sense of humor also helps students become attracted to the course. Overall, amazing teacher!" "He got really into what he was teaching and made every lab enjoyable. He seemed to actually enjoy doing what he does and he's very helpful." "He is very knowledgeable and helpful. Always loves to chime in while we're doing a lab to point out interesting facts and keeps us on our toes. Overall he is an excellent instructor." "... Professor Mathys constantly stresses the importance of asking questions either in class, through email, or out of class meetings. Overall Professor Mathys is a great instructor & I would recommend him to any student interested in Biology." "Very good professor! Always willing to help and adjust his schedule to help fit yours when you need assistance or help on a subject matter." 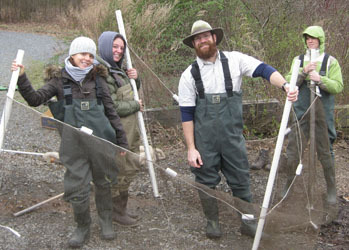 "Dr. Mathys was an excellent professor with a good sense of humor and made lab fun." "Without question the reason that this course was so great is because of Dr. Mathys. He has a love and excitement for this subject that is truly infectious. I constantly find myself calling out the names of birds when I'm getting the mail or driving in my car. He made the subject material clear and he made the class so much fun. He is extremely knowledgeable and very funny. He blends his expansive wealth of knowledge and witty humor into the perfect combination that keeps the class truly engaged. He took us on the best field trips and made the experience as a whole very enjoyable. This has been one of my absolute favorite classes that I've taken here at Rutgers, and that is a direct result of Dr. Mathys." "This course is one of those few courses that sort of changes the way a person views the world...I now have a better understanding of the landscape of bird ecology and how my behavior and actions can impact them whether it be in positive or harmful ways." "Dr. Mathys is a genuine asset to this college. We need more professors like him. He is approachable, always prepared, welcomes questions, and creates a very comfortable learning environment in the classroom. You should give him more classes to teach." "The field trips were fun and interesting. Blake was always willing to help and answer any questions, even if they didn't pertain directly to class material. He is extremely knowledgeable and the best instructor I could have hoped to have." "This is the first course where the instructor was so completely in love with the subject matter that it began to spread to me. " "Dr. Mathys makes this course effective by having a hands on approach to teaching it. He's very interactive with his students and helps all along the way. The field trips allowed me to learn about various avian life in New Jersey and as a result I'll never see birds the same way again. Dr. Mathys is an exceptional professor and is what Rutgers University needs at the moment. The course and Dr. Mathys go hand in hand and I do not believe any other professor would impact its students the way Dr. Mathys has nor would they teach the course the same way." "I loved the field trips and encouragement to participate. 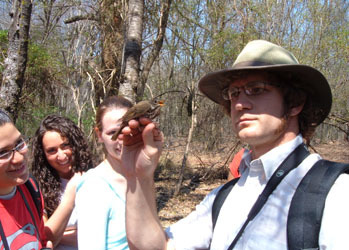 The knowledge and enthusiasm of Dr. Mathys [and our teaching assistant] demonstrated expert knowledge, professionalism and contagious enthusiasm towards this interest that seemed to turn those at first taking the subject for necessity to interested bird identifiers and involved learners during lectures." "Very knowledgeable about the course material and had a lot of interesting things to talk about in regard to the topic - very good Instructor"
"Great teacher, good sense of humor, very informative"
"You can tell Dr. Mathys knows a lot about the subject and has a passion for it. He also really enjoys teaching and likes student participation..."
"He is very passionate about biology." "He loves what he does and knows a lot about Biology..."
"...he is quite amazing at teaching the material...He also challenges us to think critically." "...he just makes you want to get more and more involved. Also, he makes it easy and fun to understand." "...he is great at teaching." "He was a great teacher and we all liked him a lot." "...friendly and informative, cares about what he's teaching. Fair and reliable." "...he makes time for his students and has a great sense of humor." "I would recommend this instructor. He was lively and made the class fun, and did a great job of explaining the material."